Description: This is a amazingly agile and low cost wirelessly controlled robot. 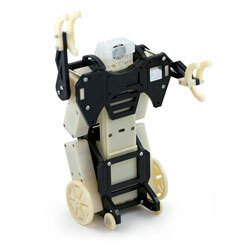 The RFL robot by Active Innovations has four specially designed, independent, high-torque motors for driving, throwing, and generally being mean. The dream behind RFL (Robotic Football League) is to create a league of robots and players to compete in a game of American Football. The robots can actually block, knock each other over, throw and receive a velcro football. They even talk trash to each other whenever a competitor's IR signal is detected. We've got some grand plans for this simple robotic platform. The really impressive thing about the RFL robot is the open form factor. The robot uses a PIC 18F65J10. The remote uses 18F2321. Wireless control is FCC certified and uses a Nordic nRF24L01 connection! Both robot and remote have a easily accesible port that allows for reprogramming of the PIC and serial connection to the PIC's UART. This means hacking, reprogramming, and wireless control of whole hordes of robots is possible. Checkout the RFL website for more information.